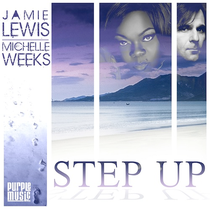 It’s nine years since they unleashed their anthemic ‘Be Thankful’, now Jamie Lewis & Michelle Weeks reunite once again for a new single collaboration titled 'Step Up', out this month on Jamie’s Purple Music label! Featuring all the essential Jamie Lewis signature sounds - a bumpin' bass groove, synth hooks, infectious beats and a little sice of disco - ‘Step Up’ is a slice of house which carries a positive uplifting message, beautifully delivered by Michelle. After 25 successful years in the business Jamie Lewis is recognized worldwide as one of the pioneers of house music and one of the scene’s premier house DJs. Jamie Lewis first appeared on the Swiss club scene in 1985, spinning classic disco and funk before getting wrapped up in the late-80s birth of house, becoming one of the European scene's major players. Lewis established his own Purple Music label in 1997, collaborating since then with influential artists of the dance music scene like the French legends Cerrone, Bob Sinclar, Etienne de Crecy, along with legendary singers like Jocelyn Brown, the Swiss awards winner singer Seven and he has also remixed song for artists like Prince, The Weather Girls and Billie Ray Martin. Since the early-90s, Michelle Weeks has been a staple in the dance music community. Her powerhouse vocals have been showcased on numerous releases, including the classics 'The Light' and 'Be Thankful'. Michelle has worked alongside producers such as Tony Moran, Jamie Lewis, The Basement Boys, Andrea Paci, Bini & Martini, Seb Skalski, Ron Carroll, Terence Parker and Dj Dado, to name a few. Michelle has appeared on some of the world’s biggest Dance music record labels, including Strictly Rhythm, Ministry of Sound, Purple Music, Stealth, Kingstreet, Defected, Code Red, MN2S & Jellybean Recordings. ‘Step Up’ is out July 15.